Newfangled muon imaging recently discovered a huge empty space inside Khufu's Pyramid (also known as the Great Pyramid of Giza), but exploring these ancient structures without damaging them is tricky. Two French research institutes have come up with an intriguing concept: An autonomous robot blimp. 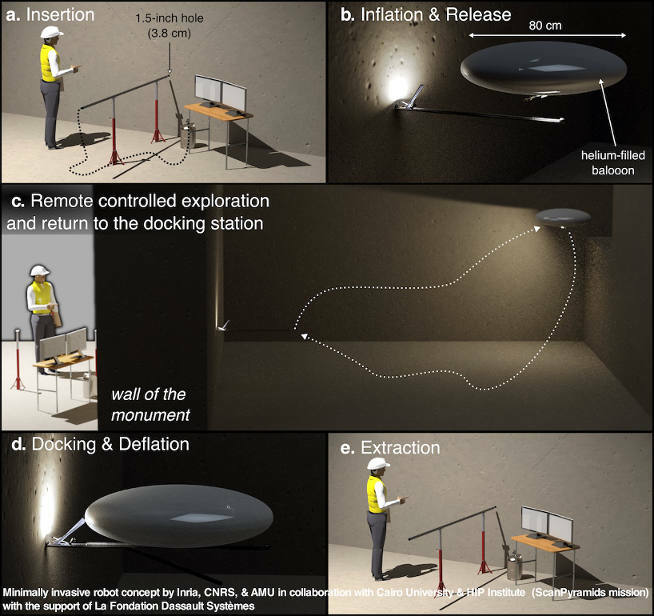 It would collapse to such tiny size that they could drill a 3.5-mm hole into the pyramid, inject the blimp on a rod-like docking station, whereupon it inflates and floats around exploring the interior. When it's done, it returns to the docking station and the researchers pull it back out. Doing exploration like this with a fold-up flying robot sounds like it might be unnecessarily complicated and risky, but there are quite a few good reasons why it would be better than other types of ground robots with wheels, tracks, or legs, or drones with rotors. A blimp doesn’t have to worry about stairs, rocks, ramps (or traps). You get a much better perspective from a blimp, and you can also cover more area more quickly. Blimps can also harmlessly bounce off of obstacles and are less likely to crash than a conventional rotorcraft, and you have to figure that a blimp crash (if it does occur) would be much more pillowy in nature. The researchers have a prototype of the rod-like injectable dock done; next, they have to make a blimp prototype. I hope this doesn't become vaporware, because autonomous blimps are a) just generally rad, and b) could be useful for all sorts of exploration, including maybe search-and-rescue.